May 27 is National Grape Popsicle Day. Make your own popsicle with America's favorite flavor. Popsicle is great summer treat and it can be made with any kind of fruit. Orange, cherry and grape are the most favorite flavors in the USA. The first popsicle was made in California in 1905 by accident. 11-year-old Frank Epperson used flavored white powder to make some soda. He left his mixture with a stirring stick on his front porch overnight. That night the temperature reached its record low level, that is why Franks's soda froze. He admired the frozen treat, and this inspired him to make fruit-flavored popsicles. Epperson served his treat at fireman's ball in 1922, and it was a huge success. In 1923 Frank made and sold his treat-on-a-stick at an amusement park in California, and in 1924 he applied for a patent. 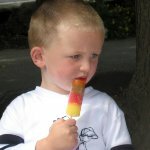 He called his frozen treat “epsicle”, but later changed its name to “popsicle”. Today you can find any kind of popsicle sold at store. But grape popsicle deserves to be a king of the day, after all, purple is the color of royalty.